Brrrr it’s COLD outside. One of the coldest winters that I can remember since I started farming 8 years ago! 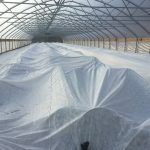 Luckily everything seems to be surviving in our tunnels under numerous layers of row cover.